1) Mix all ingredients together in a bowl. 2) Refrigerate the dough for several hours. 3) Roll out the dough on floured pastry board. 4) Cut out circles onto baking sheets and fill with a spoonfull of filling. 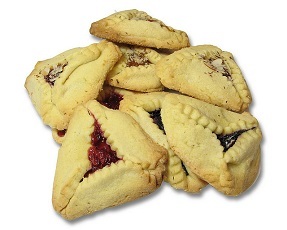 5) Pinch the corners together to make the traditional Hamantashen shape. 6) Bake at 350 degrees until golden brown.